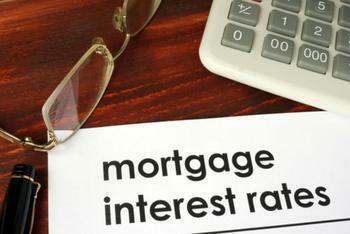 Interest rates are on the rise. In the latest report from the Mortgage Bankers' Association, the average rate for a 30-year fixed-rate mortgage rose slightly in mid-February to 4.36%. For many people that seems high, since rates have bounced between 3.5% and 4.0% over the last few years. But exactly how much will rising mortgage rates affect your monthly payment if you buy a home in the next few months? We'll do some math to find out, using two 30-year fixed-rate mortgages -- one for $150,000 and one for $250,000. If you were fortunate enough to lock in a rate late last year, you might have gotten a 30-year fixed-rate mortgage at 3.8%. Last November, if you had gotten that 3.8% rate on a mortgage of $150,000, the principal and interest would be $699 a month. On a $250,000 mortgage the principal and interest is $1,165. These numbers don't include tax and insurance, which are normally rolled into the monthly payment, meaning the actual payment could be $200 to $300 higher. But for comparison purposes, we'll focus solely on principal and interest (PI). So what does the most recent average rate of 4.36% do to PI in both scenarios? On the $150,000 loan, the PI is $748, an increase of $49 a month from last fall. For the $250,000 mortgage, the new PI is $1,246, an increase of $81. But the forecast is for mortgage rates to keep climbing, so let's check the payment when it reaches 5%. On the $150,000 mortgage the PI is $805, up another $57. On the $250,000 loan, the PI is now $1,342, up another $96. Now the $150,000 loan is $106 more a month than if you had locked in during November and the $250,000 mortgage adds $177 to the monthly payment. But might mortgage rates go even higher? They could. After all, during the housing boom rates were around 6%. So what happens to our two monthly payment if rates go up another full point? The PI on the $150,000 loan is now $899, compared to $748 this month. The PI on a $250,000 mortgage would be $1499, compared to $1,246. Erin Lantz, vice president of mortgages for Zillow Group, says low rates were a big reason the housing market was able to recover after the crash. But when rates go up, he says buyers will undoubtedly feel the effects. "As rates rise this year, first-time buyers and those looking to buy in expensive markets where affordability is already an issue will feel the pinch of higher rates on their budget," Lantz said. And rates aren't the only thing increasing the monthly payment. As home values continue to rise, so will the amount that needs to be financed, presenting buyers with a double whammy when it comes to affordability.